Cheshire East Council is to receive £900,000 to repair damaged roads following the severe winter weather. The cash has been given to the Authority from the Government following last week’s Budget announcement. It stated that a total of £100 million pounds would be made available to tackle the nation’s potholes. Cheshire East Council saw a 100% increase in pothole reports following the heavy snow and freezing temperatures experienced across the area earlier this year. The additional money is to be spent repairing potholes and improving local roads as a whole. “There is no doubt the winter weather experienced across Cheshire East in December and January had a big impact on local roads. We have seen a big increase in potholes which meant we had to look at our budgets carefully. Cheshire East Council Trading Standards Department has welcomed the sentencing of three people who sold counterfeit goods at local car-boot sales. Following a number of test purchase operations, carried out by Trading Standards, the trio were found to have sold counterfeit music and films worth in excess of £11,000 between July 2008 and June 2009. They were charged with a combined total of 11 offences, contrary to the Trade Marks Act 1994. Yesterday (Monday, March 29) Macclesfield Magistrates Court saw the sentencing of John Power of Wythenshawe, Manchester and Christopher Loftus and Patricia Flint of Burnage, Manchester to a 12 months Community Order, a 12 month Community Order plus supervision and 120 hours of unpaid community work respectively along with £750 in costs, each. Following the arrests in June last year, over 500 discs were seized from the stall at Chelford car-boot; these discs along with previous test purchases were valued at a genuine retail cost of over £11,000. “This serves as a stark warning to those involved in the sale or possession of counterfeit goods, our Trading Standards Department takes a proactive stance in visiting our car-boots and markets and will not hesitate to take action to protect the local community." Anyone with information relating to counterfeit goods or requiring advice should contact Consumer Direct on 08454 04 05 06. The wheels are in motion for a major cycleway project in Crewe. Connect 2 Crewe is aimed at developing cycling and pedestrian routes between Crewe and Nantwich. · The construction of two bridges in King George V Playing Fields to cross streams. Works are expected to start onsite in the summer of 2010. Funding has been secured from a variety of sources, including SusTrans, Waste Recycling Environmental Network (WREN), as well as Cheshire East Council’s Capital Programme. “Its pleasing to see this project is now underway. Connect 2 Crewe is a vital scheme which looks to improve transport links and boost the local economy. “As we all know, time spent doing leisurely activities can be limited because of busy working and family lives. I hope the cycleway will encourage local families to get out and about as well as attracting more visitors to the area. “From an environmental point-of-view, this is an exciting project; Connect 2 Crewe is about encouraging everyone to leave the car at home and to walk or bike-ride around the town. A major revamp of Crewe train station is at the heart of ambitious plans to transform Crewe into one of the UK’s leading economic powerhouses by 2030. And the move has even got the vote of TV’s Eurovision pop guru Pete Waterman. A major redevelopment of the rail station – which is staying put – and the town centre are central to a new scheme to rejuvenate the town and wider region – and catapult them to the forefront of the 21st century economy. Music mogul and trains enthusiast Pete Waterman, Virgin Trains, Network Rail and rail engineering giant Bombardier are among the ‘movers and shakers’ who have backed the station announcement. Crewe’s MP Edward Timpson has also called for the whole community and all political parties to get behind the proposals. Record producer and Eurovision: Your Country Needs You star Pete Waterman said: “Now the decision has been made so far as the station is concerned, we can all get on with the job of making this work. The redevelopment of Crewe station will be one of a number of high-profile ambitious projects planned for the town over the next 20 years. The proposals, due to be completed shortly, are the result of six months of work led by Cheshire East Council and the Northwest Regional Development Agency (NWDA) involving leading agencies, organisations and employers in the area, in partnership with top consultants SQW. This new vision for Crewe builds on the tremendous competitive advantage of the town’s central location and fantastic road and rail links. Cheshire East Council Leader Wesley Fitzgerald said: “We are now at the critical point of setting out not just our vision for Crewe, but how we are going to get there. “Crewe rail station was at the centre of the town’s identity, growth and prosperity in the 19th century. Now it is at the heart of plans to transform Crewe to help its growth to meet the challenges of the 21st century. Cheshire East received an additional boost last week, with a government funding announcement that saw Crewe move a step closer to benefiting from a £36m link road that would cut congestion and boost economic regeneration in the area. Transport Secretary Andrew Adonis announced that £21.99m has been provisionally agreed for Crewe Green Link Road South. Cheshire East Council, which has worked hard to secure funding, and other supporters of the scheme said the move was vital to opening up the regeneration potential of the Basford east investment site and the wider Crewe region. NWDA chief executive Steven Broomhead said of today’s announcement: “The decision over Crewe train station is a big step forward – plans for future development can begin to move forward and Crewe can maximise the opportunities of its excellent infrastructure. Cheshire East Council has called on the Government, the rail industry, regional agencies and top ‘movers and shakers’ to pledge their support for these major projects – especially to ensure that the station becomes a gateway to both the north and south. The station proposal follows a recent announcement by Lord Adonis that £50m would be made available to invest in 10 stations in real need of some serious TLC – one of which was identified as Crewe, which has unrivalled rail connections and excellent north-south links. Crewe received another massive boost with the recent government announcement (March 17) that it is to create a £3m National Skills Academy for Rail Engineering. It is hoped this will be based in Crewe, following high-level lobbying by the Cheshire and Warrington Economic Alliance. Cheshire East councillor Jamie Macrae, Cabinet member with responsibility for prosperity, said of the ambitious new proposals for Crewe: “This work is vital. We must capture any opportunity to make it happen. We must continue to work together to ensure Crewe has an integral role in the future of the region. “We’ve done more in the past six months to help achieve this than has been done by previous authorities in the past six years. Chris Gibb, chief operating officer at Virgin Trains: “Crewe is a key part of the Virgin Trains network and we have been delighted with the growth in customer numbers using the service in Cheshire in recent years. It is hoped the recent HS2 announcement of plans to build a new High Speed Rail link from London to Birmingham from 2017, and then on to Manchester, will benefit Crewe and the Cheshire East region. Supporters say it would free up train and freight capacity and raise the possibility of increased rail engineering and maintenance work for Crewe. Crewe and Nantwich MP Edward Timpson has appealed for cross-party support to help make the redevelopment scheme a success. He said: “Following last year's announcements that Crewe station was receiving no redevelopment funding from central government until at least 2014, and that the developers of Crewe town centre had fallen victim to the recession, it was essential that the new Cheshire East authority moved quickly to come up with a credible plan for the town's economic future. "The station is a key part of that. It is now time for all of us who care passionately about Crewe to drive forward these ambitious plans together. I will do all that I can to make that happen." Attracting more educated, skilled and ambitious workers to Crewe would boost the economy and see the town as a nationally recognised centre of dynamic economic growth and vitality by 2030. Substantial investment will be required to create the 21st century transport hub that is necessary to underpin Crewe’s aspirations for growth. Cheshire East is seeking both public and private sector partners to fund and deliver the project. Network Rail and Global rail engineering firm Bombardier Transportation, which has a major plant in Crewe, have thrown their weight behind the ‘exciting’ proposals for the station. Bombardier Transportation UK chairman Colin S Walton said: “As a major employer in Crewe, Bombardier is pleased to be able to offer its expertise and support to this exciting plan to transform the town. “Crewe's current image is that of a historic railway town, which is important. However, we now need to be able to demonstrate that Crewe is much more than that. “Crewe is modern, hi-tech and innovative and ready for all the challenges of the 21st century. Key to this plan is the development of the railway station, providing a modern and attractive gateway to the town"
Network Rail route director Jo Kaye said: “We are fully committed to the principle of the regeneration of the station. Current funding available to Crewe, following the announcement by Lord Adonis of £50m for 10 stations, will enable limited refurbishment work but is only a small part of the investment required. However, a new transport hub could be delivered for something in the region of only 10-15 per cent of the recently announced £530m Northern Rail Hub proposals. An independent report called Better Rail Stations, by the Station Champions Chris Green and Sir Peter Hall, advised the Government on ways to improve stations, focussing on getting their basic facilities right as well as considering the broader role they could play in the future. The report said the “passenger’s first priority is clearly the journey itself” – but a smart, modern station is an important element which can “make or break” the public transport experience. The study found that only two thirds of customers are satisfied with Britain’s stations. This is a mediocre result, and the authors said “a demanding service industry should be seeking to lift this to at least an overall satisfaction level of 80 per cent”. Sandbach’s world famous Foden’s Brass Band has received a chorus of Cheshire East congratulations after becoming North West record breakers. The band won its fifth consecutive championship after fighting off competition from 11 rivals in the North West Area Contest held at the Winter Gardens in Blackpool. The band – currently ranked second in the world - has now surpassed the record held by the legendary CWS (Manchester) band of the 1960s. Cheshire East Deputy Mayor Gordon Baxendale said: “My warmest congratulations go to Foden’s Band for yet another incredible achievement. 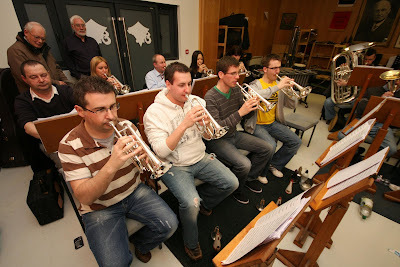 “This latest triumph follows on the heels of Foden’s rise to second in the world in the international brass band rankings last year. Band members were guests of honour at a reception to celebrate their achievement at the Sandbach headquarters of flooring company Flowcrete, which has provided the band with rehearsal rooms. Foden’s will now go head to head with seven other regional winners in the national finals to be held at the Royal Albert Hall in October. The band - named because of its links to the former Foden Truck company - has now won 17 North West titles including an incredible eight out of the last 10 competitions. A government watchdog has highly praised Cheshire East Registration Service – and is to highlight it nationally as a model of successful innovation. Whitehall’s General Register Office (GRO) – part of the Home Office’s Identity and Passport Service – gave a glowing report on the high quality of Cheshire East civil registration services following the reorganisation of local government last April. The Registration Service deals with the registration of births, marriages and deaths. The study praised the council’s contact centre and said customer access to the registration service was “excellent” with convenient access points and opening hours. 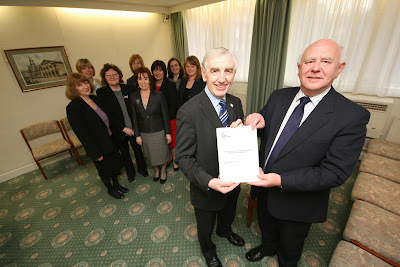 Councillor Brian Silvester, Deputy Leader of Cheshire East Council and Cabinet member with responsibility for safer and stronger communities, said: “This is an outstanding report and all the staff in the Cheshire East Registration Service are to be congratulated on their sterling and dedicated work. “The Registration Service is rightly being held up nationally as a model of successful innovation, and Cheshire East should take great pride in this. The GRO assessed Cheshire East Registration Service on four key areas: customer access; certificate stocks and register control; marriage and civil partnerships administration; performance monitoring against key indicators and good practice guidelines. Cheshire East’s Superintendent Registrar Alan Clarke said: “I would like to thank all the staff involved as it is their commitment and enthusiasm that has made this service so successful. The innovative online booking service for making appointments and registering deaths is being held up by the Registrar General as a model of good practice for other services across the country to adopt. This success is largely thanks to the work of Leighton Hospital bereavement officer Liz Robinson as well as Molly Pearson and Pam Bostock at Macclesfield General Hospital. They have been particularly proactive in making this online service possible. Former Dragon’s Den ‘Dragon’, Rachel Elnaugh, gave local entrepreneurs a piece of her business mind earlier this month. On Thursday, March 18 independent retailers gathered together for ‘Let’s Talk Shop’; an event organised by Cheshire East Council’s Recession Recovery Group. · How to make customers aware of what is on offer. The event was open to any local independent retailers. Those in attendance included pub landlords, hairdressers, café and restaurant owners and retailers in market towns and rural areas. The evening, held at the Ramada Encore Hotel on the Crewe Business Park, featured a keynote speech by entrepreneur Rachel Elnaugh, one of the original ‘Dragons’ in the BBC television series Dragon’s Den. Bill Smith, a retail business guru from the South Lakes Development Trust, hosted an interactive presentation giving an insight into how to make positive first impressions when a customer visits your business. Bill and Rachel along with Cheshire East Council’s Head of Regeneration, Caroline Simpson, then hosted a question and answer session. This gave retailers an opportunity to share their experiences and ideas and get helpful information and advice. “This was a positive and motivating evening which I am sure was of great benefit to many local independent retailers. The current economic climate continues to make life difficult for our small business owners. I do hope that the Let’s Talk Shop event served to boost confidence by providing guidance and advice. In the last couple of weeks there have been a number of theft from vehicle offences committed within the Crewe & Nantwich area, with no specific area being targeted. In the majority of these cases access has been gained to the vehicles via an insecure door. Help to beat the opportunist thief by taking advantage of the security features that are in place in your vehicle and by following crime prevention advise in respect of what you leave on show in your vehicle. * Ensuring that your vehicle is locked increases the time that it takes an opportunist thief in gaining entry to your vehicle and in doing so increases the likelihood of them being spotted and caught. Take the extra time to check your doors and windows before leaving the vehicle, it'll be worth it in the end. * If you have a car alarm please use it. The noise alone should be sufficient in scaring a burglar away. * Wherever possible don't leave items on show in your car. Try and maintain a tidy vehicle and remove anything from clear sight that might catch the eye of an opportunist thief who is passing by. Be mindful that not only seemingly expensive items such as sat navs, cd-players and tools are taken. People stealing from vehicles may break into a car for seemingly random or inexpensive items such as old coats, clothing, handfuls of change, sunglasses, rucksacks. * Remember that just because you know something left on show is of no value or interest doesn't meant a thief does. A dirty sports kit in a rucksack left on the seat, your used lunch box wrapped in a carrier bag in the foot well etc will no doubt prove of little use to a thief when they find out the contents but if they don't know what is in the bag they may take the chance to break in and see and the subsequent effect on the victim in terms of emotional impact and cost of repair can be great. Shoppers in Crewe town centre are being warned to protect themselves from purse-dippers. Police say people need to be sure they are following basic crime-prevention guidelines. If in doubt, they should stop any Police Community Support Officer who is patrolling the area and get advice. The warning follows more than ten incidents of purse thefts in the past month. Four were reported on one day. P.C.S.O Paula Davies said, “Purse dippers can be beaten if people take a few simple precautions. In general terms, shoppers need to keep their purses in a zipped bag and carry the bag in a position where they can see it at all times. Never carry it slung behind you or leave it in a shopping trolley! “Purse alarms are a good deterrent to thieves, and are cheap. Alternatively you can tie a couple of small bells to your purse. “If you carry money in a wallet. keep it in an inside pocket. You can also help yourself by not carrying large amounts of cash. “You also need to be sensible about your cards. Despite loads of warnings, some people still carry a note of their PIN numbers in the same purse as the cards. In one of the recent incidents the thief had taken several hundred pounds from a cash point before the owner noticed the purse was missing. “Purse dippers will often target people who look vulnerable or harassed. So try to keep alert and look in control of things. I and my colleagues spend most of our time on foot patrol, so if you need any advice about staying safe feel free to stop us and ask. v Carry your purse inside a closed bag. v Carry the bag where you can see it. v Never leave your bag in a supermarket trolley or shopping trolley. v Get a purse alarm and use it. v Carry your wallet in an inside pocket in your jacket or coat. v Never carry notes of your PIN numbers. v Walk with confidence. Avoid looking distracted or confused. v Be careful in crowded areas. Thieves often jostle victims as a distraction. v Take care at cash machines. Purse dippers may be lining up potential targets. Cheshire East Trading Standards are warning local residents to be on their guard. The announcement follows a series of reports to Trading Standards about home security companies cold-calling across the area. In some cases, companies have offered to fit alarms for unusually low prices or even for free. Trading Standards are concerned this could then lead to additional costs surrounding the installation and the on-going maintenance of the system. Cheshire East Council Trading Standards and local police have been contacted by a number of local residents seeking reassurance and advice. “In these situations, a common-sense approach is called for; if something seems too good to be true, then it probably is. “Cheshire East Trading Standards encourages local residents to say ‘no’ to all cold-callers. If you are genuinely interested in purchasing an alarm system then always obtain at least three quotes and seek recommendations from friends and family. “Should you agree to buy an alarm system at home you should be given notice of the right to cancel: this is known as a seven-day ‘cooling off’ period. If you are not given this information you cannot be held to the contract. Cheshire East is a step closer to benefiting from a £36m link road that would cut congestion and boost the economic regeneration of Crewe and its surrounding area. Transport Secretary Andrew Adonis has announced that £21.99m has been provisionally agreed for Crewe Green Link Road South. The 0.68 mile route would be built between the A500 Hough-Shavington Bypass and the A5020 Weston Gate roundabout. Cheshire East Council, which has worked hard to secure funding, and other supporters of the scheme say the move is vital to opening up the regeneration potential of the Basford east investment site and the wider Crewe region. Lord Adonis said in his announcement: “The Crewe Green Link Road South will provide a link between areas of deprivation to the north of Crewe and employment opportunities to the south east of the town. “This will support sustainable economic growth and help ensure the town has the infrastructure needed as a key regional transport gateway. The scheme – which has received initial Government approval – will improve journey times to the town centre and support major economic growth in Basford, as well as improving access to other development sites in the south east of Crewe. Councillor Jamie Macrae, Cheshire East Cabinet member with responsibility for prosperity, said: “This announcement is excellent news for Crewe and the whole of Cheshire East. The Crewe Green Link Road South is the final phase of the Crewe Green Link Road, connecting the A534 at Crewe Green and the A500 Basford-Hough-Shavington Bypass. Today’s announcement grants the Crewe Green Link Road South major scheme ‘Programme Entry’ status in line with the Department for Transport’s (DfT) local major scheme guidance approval process. This means the DfT expects to fund the scheme subject to availability of funds, costs remaining the same and the relevant planning permission being obtained. The next stages of the approval process are normally ‘Conditional Approval’, once the necessary legal powers are in place and ‘Full Approval’, once final supplier prices have been secured. Cheshire East Council will work with developers and the NWDA to secure the remaining £14.47m funding needed to carry out the scheme. Steven Broomhead, chief executive of the NWDA, said: “This announcement is a huge step forward in the delivery of Basford east, which will transform the economic base of Crewe. Today's decision means that Cheshire East Council can move forward with detailed planning for the scheme. The link road will also have a segregated footway and cycleway on both sides along its length and segregated pedestrian and cycle crossing facilities at three locations. The Crewe Green Link Road South will also help tackle the environmental impacts of traffic currently affecting local communities in Crewe and some of its surrounding areas. Cheshire East has been awarded more than £125,000 of government cash to help protect homes from flooding. The Department for Environment, Food and Rural Affairs (DEFRA) grants will be used to boost flooding defences for 20 homes in Vicarage Lane, Sandbach, and a farm and a terrace of four cottages in Wildboarclough. Cheshire East Council successfully bid for grants totalling £128,500 from DEFRA, under its property level flood protection and resilience scheme. The grants are part of £5.3m awarded to 49 local authorities to help them tackle surface water flooding – a problem when the ground, rivers and drains cannot absorb heavy rainfall. Councillor Brian Silvester, Cabinet member with responsibility for safer and stronger communities, said: “These grants are great news for the communities living in Vicarage Lane and Wildboarclough. The Vicarage Lane project has been awarded £100,000. The money will be used to enlarge the existing surface water drains to help prevent flooding during heavy rainfall, which has previously affected 20 properties. The project will replace existing 125mm-diameter drains under the road with 425mm-diameter pipes. An extra manhole and water retention chamber will also be added to increase the system’s water capacity. The work, which is due to start later in the year and will take several weeks to complete, will not affect the look of the lane. A grant totalling £28,500 will provide anti-flooding measures for Dingers Hollow Farm and the four properties at Edinboro Cottages, Wildboarclough. The work could include flood-resistant doors for the properties. Surveys will be commissioned as soon as possible, with the work due to start later this year. The scheme will be completed by March 2011. Macclesfield Forest councillor Hilda Gaddum said: “I particularly welcome the support given by this grant for the low-lying dwellings in Wildboarclough, which have suffered flooding in the past. One person died when flash floods hit Wildboarclough valley on May 24, 1989, and the farm and terrace of cottages suffered extensive flooding. The homes have experienced several flooding incidents since. The DEFRA grants were announced by the Environment Minister Huw Irranca-Davies. Last year, local authorities were invited to submit bids – from £20,000 up to £100,000 – to carry out immediate engineering works and to produce management plans to help them tackle known local flooding problems. Are you a customer of Abbey National (Santander) if so have you checked your statement this month? A family member received the bank statement and on the front page half way down noticed it said we will charge you £25 next month for being overdrawn. As the account had thousands in it and never had less than 3K in they were shocked as they were no were near being overdrawn. On contacting Abbey they said they had hundreds of people coming in with the same problem. So check your statement carefully. Just think if they have 2 million customers they have done this too and only 50% notice they will make 25 million pounds which is frightening. Cheshire East Mayor Margaret Simon unveiled a school’s colourful new library and then gave youngsters a guided tour of Crewe’s Municipal Buildings. The Mayor and Consort were guests of honour at the official opening of the Key Stage One library at Haslington Primary, which features brightly painted murals showing plants and garden creatures. The Mayor also judged an art competition after pupils at the school in Crewe Road, Haslington, were asked to create pictures of their pets or creatures from their imagination. After enjoying a school lunch with pupils, the Mayor and Consort met the 18 members of the school's Council back at the Municipal Buildings in Crewe, for a tour and refreshments. Councillor Simon said: “The library looks lovely and is a really excellent resource for the youngsters. Thanks must go to the talented school staff involved in creating and painting the mural and in making the library a colourful place, where the pupils will love to spend some time. The 280-pupil school held a non-uniform day during the VIP visit, which helped raise hundreds of pounds for the Mayor’s Charity – Action Duchenne, which helps sufferers of muscular dystrophy, and Hearing Dogs for Deaf People. Cheshire East is calling on community groups, schools and voluntary bodies to grab the chance to appear on TV and win a slice of £250,000 to boost their causes. The People’s Millions 2010 competition is open to projects in the ITV Granada region to put in bids to receive up to £50,000 each from the Big Lottery Fund (BIG). It is the sixth year of The People’s Millions competition, which helps communities improve facilities or get more enjoyment from their local area. Five bumper Big Lottery Fund grants are on offer to community projects in the ITV Granada region, with a total of £250,000 to be awarded. The People’s Millions, a partnership between BIG and ITV, gives the public the chance to vote on which local projects should receive lottery good-cause funding. Shortlisted groups will get the chance to make a short film to showcase their cause on local ITV evening news – to persuade the public why they should get the cash. It will then be up to the public to vote to decide which groups win funding. To date the contest has awarded more than £1.2m in the ITV Granada region, funding a wide range of community projects from sports activities for young people in the school holidays to schemes to breathe new life into outdoor spaces or restore much-loved community venues. Councillor Brian Silvester, Deputy Leader of Cheshire East Council and Cabinet member with responsibility for safer and stronger communities, said: “The Big Lottery Fund and ITV are calling on individuals and groups to come forward with their brilliant ideas to improve their local communities. Entries need to be returned to the Big Lottery Fund by noon on Friday, May 14, 2010. The shortlist will be drawn up in October, with the People’s Millions competition being televised on ITV in November. People can apply for between £20,000 and £50,000. You can enter if you are part of a community or voluntary group or if you are a school or local authority. Textphone for those with a hearing impairment is 0845 602 1659. There is a footpath from davenport ave., crewe to gresty that runs along gresty brook. Behind 43 charlcote crescent there is a very sharp, deep and slippery fall to the brook. There used to be fence there some years ago but that has now gone. Someone could easily slip off the footpath and then there is nothing to stop them ending up in the brook. I reported it to the Cheshire East Council after a resident raised the concern. I am very pleased that a fence has been speedily erected by the Cheshire East Council. The reason for the sheer drop from the fence to the brook is that the brook is eroding away the earth at that bend in the brook. At my request Cheshire East Council is to contact the rivers authority to see if they can take action to prevent further erosion because if it carries on then the new fence could become unstable in years to come. Photo Caption: Debbie Worsley and her award-winning dessert. The culinary talents of a Cheshire East catering supervisor have won her acclaim in the North West heat of the School Chef of the Year Awards. 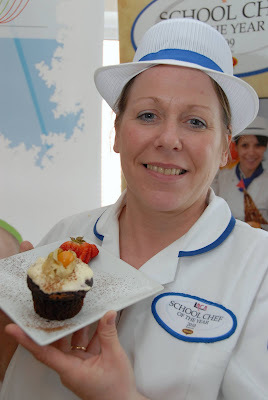 Debbie Worsley’s dessert of chocolate surprise muffin with soft cheese frosting was highly commended by judges. She competed alongside seven other school chefs from across the region to cook a low-cost, healthy two-course meal for 11-year-olds under timed conditions. Her main course was chicken and hidden vegetable lasagne with salad and garlic, lemon and chive bread. The contest, held at Knowsley College, was judged by a chef, a dietician, a local authority catering expert and two 11-year-old pupils from a local school. Lancashire’s Glen Moody was named overall winner. Debbie, a catering supervisor at Warmingham Primary School, progressed to the regional heat after she was crowned Cheshire East School Chef of the Year last October. “I was thrilled that the judges chose my dessert for the highly commended award, particularly given the high standard of all the entries,” she said. The annual School Chef of the Year competition is organised by the Local Authorities Catering Association (LACA). The contest is open to all kitchen-based staff employed by organisations that are full members of LACA and are involved with the daily preparation of school meals. Judging is based on eight strict criteria that range from flavour and presentation to the ability to replicate the dishes en masse in school. Councillor Paul Findlow, Cabinet member with responsibility for chidren and families, said: “Debbie’s tasty meals have been a big hit with judges in both the Cheshire East and regional heats and I would like to congratulate her on her success. 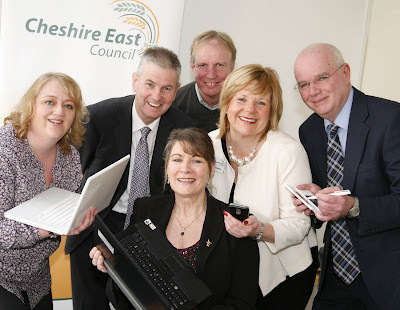 Cheshire East Council’s website has been given a three-star rating by top IT consultants. The Society of Information Technology Managers (SOCITM) ranked www.cheshireeast.gov.uk just one star below the top score. Only 11 of Britain’s 433 councils got four stars – and none were unitary authorities. Councillor David Brown, Cabinet member with responsibility for performance and capacity, said: “Cheshire East is committed to making it easier for people find out about and access council services in a way that is quick, convenient and hassle-free. Cheshire East’s website was awarded a three-star rating based on how useful, usable and well used by the public the online service was. The topics it was assessed on included jobs, library services, schools, family history, planning and waste collection. Of the 433 councils assessed in the first Better Connected annual survey of local authority websites, 117 (27%) were awarded three or four stars. Of the nine new unitary authorities, only Cheshire East and Shropshire achieved three stars. Four were awarded two stars and three got one star. ● 1,265 online forms were submitted to report problems with potholes/gritting/street lighting in January 2010. Nikki Hughes, Cheshire East Council’s online services manager, said: “We are delighted our website has won this recognition and has been viewed so positively. “One of the reasons we got such a good rating was for online school admissions. This year, 78% of school admission applications were made online. New services to be added to the Cheshire East Council website in coming months include live traffic information and online forms for direct debits and customers’ change of address. (From left to right) Judith Gibson, Cheshire Domestic Abuse Partnership strategic coordinator; Police Chief Superintendent Craig Guildford, chair of Cheshire West and Chester Domestic Abuse Partnership strategic management group; Mickey Hemming, acting manager of Crewe Women’s Aid. Popping in to the Prime Minister’s next door neighbours proved a hit with Cheshire East Council staff. 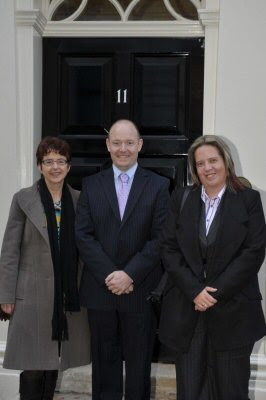 Number 11 Downing Street beckoned after the council was short-listed for a local government award. Cheshire Domestic Abuse Partnership was nominated for a Local Innovation Award for all the good work it has achieved in protecting and supporting families suffering domestic abuse. Judith Gibson, Cheshire Domestic Abuse Partnership strategic co-ordinator, said even though the council didn’t win the top prize, the experience was unforgettable. She said: “An invitation to Number 11 is quite an honour and we certainly enjoyed the moment when we climbed into a taxi at Euston and said ‘Downing Street’ please. “However, our overwhelming emotion was one of feeling privileged at representing thousands of women, men and children for whom domestic abuse is a daily experience. The council was short-listed for the ‘Achieving More through Partnership’ category, which Northumberland Council took home. The judges of the Local Innovation Awards, hosted by the Rt Hon Rosie Winterton MP, were particularly impressed by the cost-effectiveness of the Domestic Abuse Family Safety Unit’s work. For every £1 spent on its services, the public purse is saved £14. The judges also commended the range and quality of children’s support. Councillor Paul Findlow, Cabinet member with responsibility for children and family services, said: “When people experience domestic abuse their whole lives can be shattered. As well as protection from the abuser, they often need help with health, housing, parenting and a range of other issues. The Cheshire Domestic Abuse Partnership is a shared service between Cheshire East Council and Cheshire West and Chester until the end of March. Last year police attended 5,000 incidents in Cheshire East, West and Chester and 500 adults were identified as at risk of serious harm or murder and offered a range of support. Only a quarter of serious incidents were actually reported to the police. If anyone has concerns about domestic abuse they can phone a 24-hour free national helpline on 0808 2000 247 or, during the day, the Family Safety Unit on 01606 351375. Photo Caption: Short Break Carer Claire Jupp (front) with Cheshire East Council Social Workers Lorraine Hicks (left) and Judi Russell. Short break carer Claire Jupp is urging people in Cheshire East to join her to ‘Be The Big Difference’ in the life of a disabled child and their family. With support from Cheshire East Council, Claire, a 36-year-old single mother, provides regular short breaks for four children with autism and other health needs. As Share The Care Week gets underway she is backing a national campaign by the charity Shared Care Network to raise awareness of the service. The campaign encourages people to ‘Be The Big Difference’ by volunteering as a short break carer. Short breaks is the service most commonly requested by the families of disabled children. It offers families the opportunity to take a regular break from the demands of caring while playing a vital role in the child’s personal and social development. Claire, who lives in Congleton with her 15-year-old daughter Bethany, began providing short breaks for a boy with autism last summer. She enjoyed the experience so much that she is now taking on the role full-time and will soon be caring regularly for six children with differing health needs. “Without question, becoming a short break carer is the best thing I have ever done. It is incredibly rewarding and fulfilling,” said Claire. “It gives the best of both worlds - the children and I get to have fun together while their families enjoy a well-deserved break. Claire was introduced to short break caring by Cheshire East Council after making enquiries into becoming a foster carer. “I had never heard of short break caring and once I found out what it involved it really appealed to me,” she said. “I would strongly encourage anyone who thinks they may be able to spare the time to provide short breaks to find out more. Research by the Shared Care Network suggests that while 10,000 disabled children nationally are currently receiving short breaks, another 10,000 could benefit if enough carers could be recruited. In Cheshire East it is estimated that another 12 part-time short break carers and three full time specialist short break foster carers are needed to support the eight children currently waiting for a short break. Councillor Paul Findlow, Cabinet member with responsibility for children and families, said: “Short break carers come from all walks of life and may or may not have children of their own. “They may choose to look after a disabled child for a few hours or a few days at a time, depending on how much time they have to offer. “Prospective carers attend a training course to prepare them for looking after a disabled child and we provide ongoing training, support and an allowance. A recent national survey identified that only three in 10 people know about the opportunity to become a short break carer. Despite this low awareness, a relatively high percentage - one in five - said they would consider providing a short break when told how the service works. “In April 09, Cheshire East Council took on the responsibility for car parking control across the whole of the borough. Prior to this there were 3 different car parking control policies in place, with considerable differences across the area of Cheshire East. “A strategy is in place to address this, but to achieve commonality of control will take time. “The first stage of the strategy was to bring appropriate controls into the Congleton which has now been achieved for both on and off street parking. “Also, the anomaly of Sunday charging in Crewe and Nantwich has now been addressed. “We are very aware that there are still differences across Cheshire East and we now wish to draw up a fair rationale for charging across all CEC pay and display car parks. “In doing this we do have to recognise that there will be an impact on the budget. “No representations were received during the extensive budget consultation with regard to a common charging policy. The budget for 10/11 has now been set, and cannot now be changed. “In order to determine the rationale to bring fair and consistent charges across the area once and for all, a thorough exercise must be undertaken to establish what these charges should be. “In forming the new Council and bringing together 4 different polices for all services across the area, many differences and anomalies have been identified other than that of parking control. Photo Caption: Launching the groundbreaking social networking resource are (left to right) Tracy Ault, Senior Commissioning Manager for Mental Health; Phil Lloyd, Head of Adult Services for Cheshire East Council; Councillor Olivia Hunter, Cabinet Support Member for Adult Services; Ken Clemens, Policy and Campaigns Manager for Age Concern Cheshire; Jill Greenwood, Commissioning Service & Dementia Lead Manager for Cheshire East Council and Roger March, North West Regional Manager for Alzheimer's Society. A pioneering social network supporting people affected by dementia is to be launched in Cheshire East as a national pilot project. 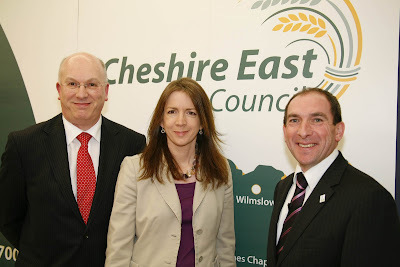 A partnership led by Cheshire East Council was selected from 32 nationwide to receive a £136,000 Government grant to pilot the web-based resource, which will operate in a similar way to Facebook, Twitter and Bebo. Users will be able to come together online to discuss the ways in which dementia affects their lives, share experiences and compare the resources, support and services available. The authority is working with Alzheimer’s Society, Age Concern Cheshire, Central & Eastern Cheshire Primary Care Trust and Opportunity Links to develop the resource, which will go live in the autumn. It is aimed at people whose lives are affected by dementia in a variety of ways embracing those with a diagnosis, their family, friends and carers, as well as health professionals. With almost 5,000 people across Cheshire East diagnosed with dementia – a figure that is predicted to rise significantly - the partners identified a pressing need for a comprehensive information and support service. Councillor Roland Domleo, Cabinet member with responsibility for adult services, said: “It is excellent news that Cheshire East will be the first in the country to benefit from this groundbreaking online resource. “I am delighted that we can harness technology often associated with the young to provide a much needed support resource. Jill Walter, Chief Executive of Age Concern Cheshire, said: “This is a fantastic opportunity to develop a new way of helping all those affected by dementia. “It will also provide our local service providers with new ways of gaining crucial customer insight and feedback so as to make our services more effective and even better value for money. Roger March, Service Manager for Alzheimer’s Society, said: “We are delighted to be working with the partnership on this innovative project which will make a huge difference to the lives of people living with dementia and their carers in across Cheshire East. “Alzheimer’s Society welcomes the use of new technology in supporting people with dementia. Mike O’Regan, Associate Director of Joint Commissioning for Central and Eastern Cheshire Primary Care Trust, said: “We are pleased to have been involved in this project from the start and are fully in support of it. LOVE FOOD HATE WASTE ROADSHOW HITS CREWE! 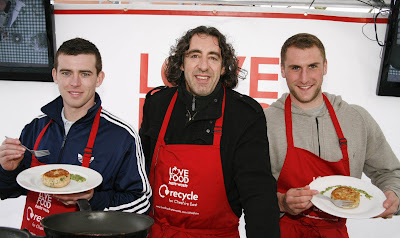 Hundreds gathered in Crewe on Friday (March 5) for the Love Food Hate Waste Roadshow. Organised by Cheshire East Council, the event in Market Square looked at how food, which would normally be wasted, could be transformed into tasty meals for all the family. From 10am until 4pm, shoppers were treated to a spectacular culinary display by celebrity chef, Richard Fox. Crewe Alexandra FC footballers Daniel O’Donnell and Steven Schumacher demonstrated their cooking skills in a live ‘cook-off’ with Richard in front of hundreds of shoppers. Richard Fox also held a 'Food Surgery’ where local residents could ask his advice on making more of their leftovers. We throw away 8.3 million tonnes of food and drink in the UK every year. The average UK family could make a saving of £50 a month by cutting down on food waste. For further information or for tips on how to enjoy food and reduce food waste please visit www.lovefoodhatewaste.com/cheshire. · Cook a large meal and then divide into portions to freeze for another day, great for days when you will be busy or home late. · Check what's at the back of your fridge and cupboards before shopping and keep an eye on 'Use by' and 'Best before' dates. · Buy your fruit and vegetables loose so you can buy exactly how much you need. This will also reduce packaging. · Invest in storage containers and bag clips for resealing bags. After opening packets of dried foods such as cereals, rice, flour and pasta, reseal them tightly or transfer them into storage boxes or jars. · Take time to plan your meals for the week ahead. You'll find it much easier when you are food shopping if you have your meals in mind. · Packs of meat and fish can be separated into smaller pieces for the freezer so you can take out the right amount you need. · Some food waste in inevitable, but items like peelings, egg shells and tea bags can be composted to create valuable home compost for your garden. Arrest Follows Club Fire A 13 years old boy was arrested on suspicion of arson after fire destroyed a disused social club in Crewe. The boy was released on police bail while further inquiries are carried out. Safe Future for Free Runners A Police Community Support Officer in Nantwich initiated steps to prevent “Free- Running” becoming a problem in the town. PCSO Stuart Mortimer said, “We had a few complaints about damage being caused by young people as they leap on to and over fences, benches and buildings while they are free-running in the town centre. They need to be able to carry out the sport where it will not trouble anyone”. Stuart linked up with local councillors, the young people involved and their parents. As the Nantwich Free Runners, they have launched a bid for money to build a free-running course in Barony Park. Calling all local employers! The event which encourages companies in Cheshire East to employ local people returns next month. Just the Job, a jobs and careers fair, will be held at the Manchester Metropolitan University, in Crewe, on Wednesday, April 28 (1pm – 6pm). Cheshire East Council is looking for local companies to get involved and match their job vacancies to local people, of all ages, who are seeking to develop their careers or are keen to re-enter the jobs’ market. The event is being organised, in partnership, by Cheshire East Council, Connexions, Jobcentre Plus, South Cheshire Chamber and the hosts, Manchester Metropolitan University. · FREE stall in exhibitors’ market place to showcase your business. · Opportunities to present your business to prospective employees. · Advice on staff development and training. · Opportunity to develop and create networks with local companies and training organisations. “The success of last year’s event is evidence of how Just the Job can benefit the local area. The current economic climate continues to ensure difficult times for local businesses. This event offers free stalls to exhibitors and the chance to speak face-to-face with potential employees. “The University strives to meet the needs of local businesses and Just the Job fits perfectly with the University’s aims to work with local businesses, the public sector and the community. Kerri Hassall at MMU Students’ Union.